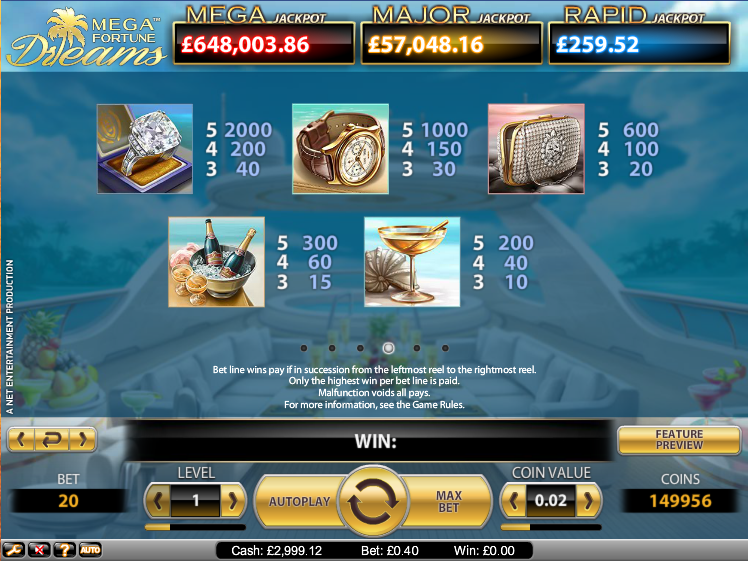 If you’ve dreamed of winning one of those gigantic progressive jackpot prizes then you may well have played Mega Fortune ; it’s Net Entertainment’s slice of gaming luxury which has produced record breaking jackpot amounts for lucky winners. The good news is it’s been updated – this new release is called Mega Fortune Dreams and it offers an even more tempting glimpse of riches than it’s predecessor. 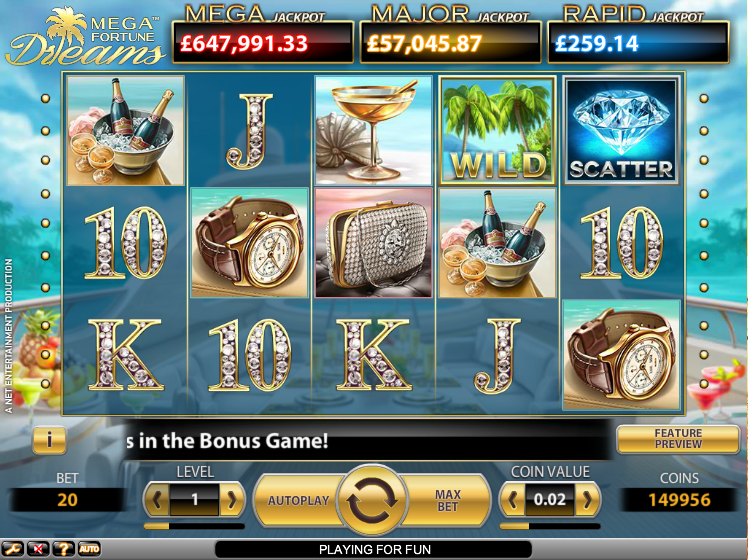 Mega Fortune Dreams is a five reel online slot with twenty paylines and it all takes place on the deck of a luxury yacht. The main symbols are as aspirational as before and include a cocktail, champagne bottles, a posh handbag, an expensive watch and a huge diamond ring. Lower value symbols are the jewel-encrusted 10, J, Q, K and A. The wild symbol is two palm trees, the scatter is a huge diamond and the bonus icon is a wheel of fortune. Let’s kick off with the progressive jackpot because that’s probably why we’re all here; the process is triggered by landing three or more of the wheel of fortune symbols anywhere on reels three, four or five. The wheel has three rings and each ring features arrows which will move you to an inner ring if you are lucky. If you can make it to the Mega Jackpot sign in the centre that massive prize will be yours. Stop on an outer ring and you can win either the Rapid Jackpot or the Major Jackpot. The three jackpot totals are displayed above the reels at all times. Landing three, four of five of the diamond scatter symbols anywhere on the reels will win you ten, fifteen of twenty spins respectively. All wins will be multiplied by 3x during this feature but if you land more scatters you will also receive a random award of up to three more spins or an extra 1x or 2x multiplier. The multiplier can reach a maximum of 10x. This is an ideal game for low rollers – the features are triggered by scatter symbols which means that you can play with minimum paylines and still activate the bonus games. This is a timely update to what was already a good game; slightly sharper graphics and some redesigned symbols mean this is a must-play for fans of progressive jackpots.